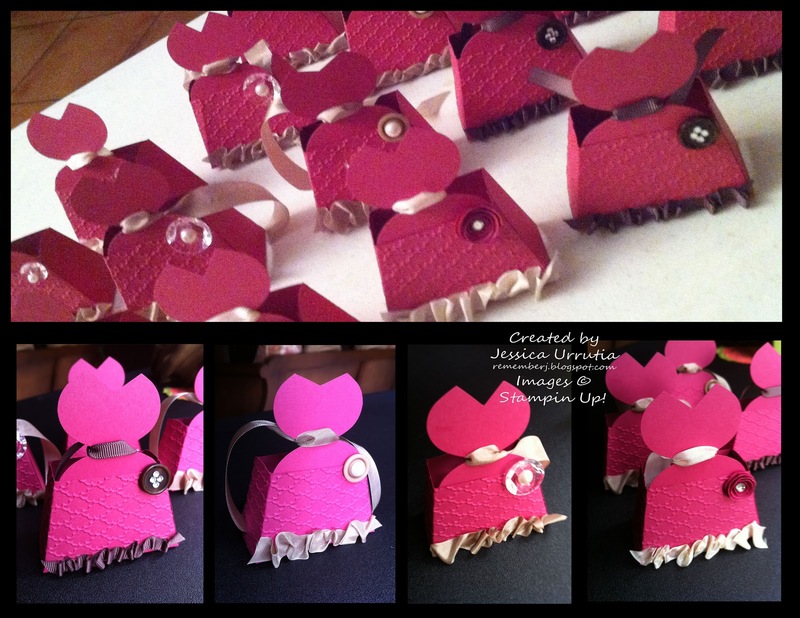 Here is another idea I came up with to give as party favors. 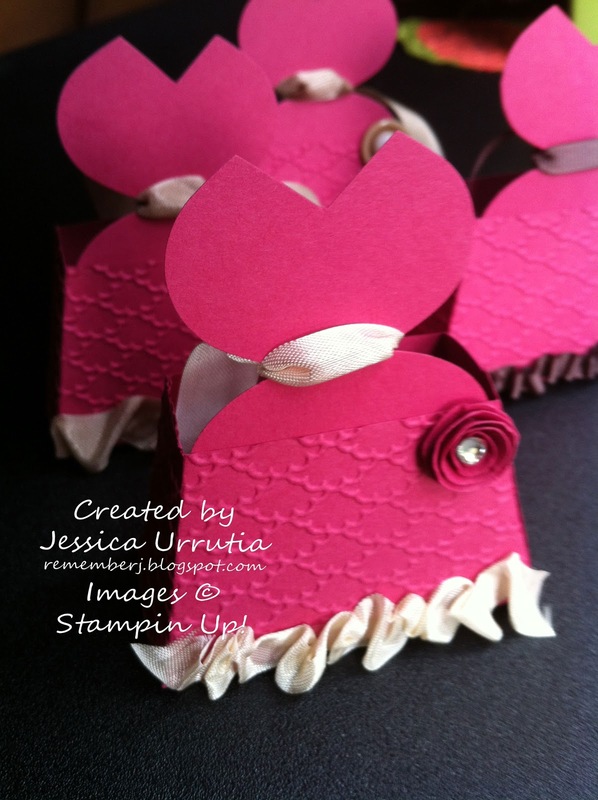 Since I got the Petite Purse Die from Stampin'Up! I thought I could make many things with it. This is one. Hope you like it, and IF YOU DO, leave me a comment here and go make someone happy with a cute little dress filled with chocolates! These could be used for Briday Showers, Baby Showers, Wedding Rehearsal Dinners or more. I made about 15 for a wonderful group of ladies that came to my Inspire meeting last week. Enjoy and God bless your creativity. Activate your creative side and make your world beautiful. My ideas come from HIM, every good gift comes from Heaven. Aqui otra idea que se me ocurrio hace unas semanas. Desde que recibi el Petite Purse Die, el de la carterita paso pensanod en que otras maneras lo puedo usar. Esta es una de ellas. Espero les guste Y SI LES GUSTA dejenme un mensajito aqui y ya luego van a crear bellezas para sus amigas. Estos trajecitos se pueden usar para fiestas de mamas, Tes para el bebe, Recepcion del dia antes de Boda...tantas maneras e ideas. Que disfruten y activen su creatividad. Mis ideas provienen del cielo...cada cosa linda proviene de El. All products Stampin'Up! Love it! 1. Cut your CS to 51/2" x 5". Positioned as shown on top of your Petite Purse Die and cut leaving the top off. Then cut the extra top as shown. 1. Corte su carulina 5 1/2" x 5". Coloque como muestra la foto en su PP die dejando fuera la parte de arriba. 2. Emboss using your Fancy Fan EF as shown in the picture. The front of my dress is actually the back of the original purse. Fold on the creases and assemble. Then Punch one Ornament and one Lg Oval shapes with your punches. 2. Repuje la cartulina como muestra la foto. La parte delantera de mi trajecito es realmente la parte trasera de la carterita. Doble en los pliegues y arme la cajita. Luego ponche un adorno navideno y un ovalo grande con las perforados de Stampin'Up! Ornament y Large Oval. 3. Pour some Tombow Multipurpose glue on the bottom of your oval and adhere as shown. Cut a V shape on the bottom of your ornament and glue upside down on the back of your oval. When dry place a strip of Sticky Strip on the bottom of your dress and ruffle some ribbon, I used here the Seam Binding ribbon in Crumb Cake. Then make a knot on the waist of your dress. Cute! You are done! 3. Ponga pegamento Tombow en el ovalo como se muestra en la foto. Pegue. Corte el adorno navideno como muestra la foto y pegue. Cuando seque ponga una franja de Sticky Strip en el borde bajo del trajacito y peque la cinta dandole esa formita. Luego haga un lacito en la cinturita del trajecito con cinta. Bonito! Ya acabo! Leave me your love with your comments, bye bye! Dejeme su amor con sus comentarios, chao chao! 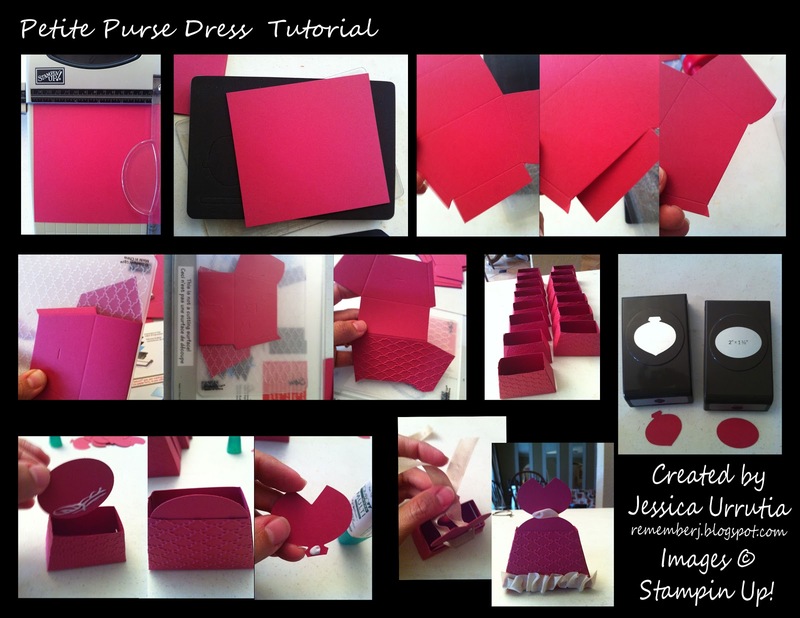 Hi Jessica, what an awesome tutorial. Love the rbight color and especially the little paper flower. These bags are way to cute! !